The (renewed) rise of China has been one of the central topics in international politics since the 1990s. This development brings along a number of far-reaching regional and global consequences. A comprehensive maritime rearmament—not only by China itself but also its immediate neighbors and other states in the Asia–Pacific region—is not least one of these consequences. 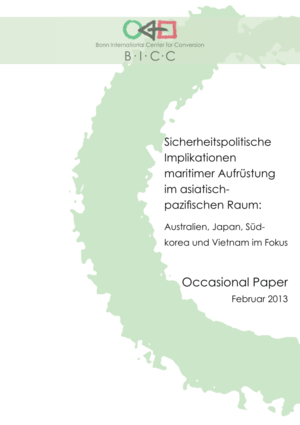 As most research reports focus on China, this Occasional Paper goes beyond that and analyzes the security policies and strategic concepts of Japan, Australia, Vietnam and South Korea and views their arms procurement in this context. With this, it is intended to sharpen the perception of regional dynamics for the naval build-up. The Chinese rise and the accompanying modernization and rearmament of Peking’s naval forces are important motives for the arms procurements of the respective countries. Even though Australia and Japan are strongly opposed to Chinese rearmament due to the possible geostrategic consequences, they do not accompany their own armaments policies with robust or even threatening rhetoric which could lead to fears of an immediate armed escalation of the numerous territorial conflicts. The combination of procurement and modernization projects as well as strategy papers rather give the impression that the states in question would simply like to be prepared for any, not so unlikely, eventuality of an armed confrontation with China. Primarily, these states, however, are just as interested in a peaceful and cooperative solution of existing conflicts as they are in a peaceful rise of China should it prove to be a responsible and trustworthy stakeholder of international politics. Still, in view of the numerous unresolved territorial conflicts, an increasingly self-confident Chinese foreign and security policy combined with growing military capabilities of all states concerned, there is the general risk of armed incidents or even conflicts. A number of measures seem to be in order and necessary to reduce the danger of escalation to a minimum and to free the way for a relationship of trust and cooperation amongst the actors involved. In the long-term, regional disarmament could be the most rewarding alternative to the currently dominating arms race. Joint action of all actors against challenges such as pirates, a revitalization and, if necessary, adjustment of the regional security architecture as well as the establishment of a functioning arms control regime—which in the long term could be translated into a disarmament initiative—would lead into the right direction. All in all, to actively enter into relationships of cooperation, transparency and trust offers more promise of success than any kind of arms race as the risks are lower than to blindly trust in the ‘natural’ establishment of an equilibrium based on quite large military abilities on all sides.